The causes of global climatic fluctuations are essentially known. For very long-term fluctuations, the earth orbit parameters are responsible for different long periods. For the period under consideration, from the late 18th to the mid-19th century, other factors play the decisive role, namely sunspot activity, volcanism and the complex feedback between atmospheric and oceanic circulation, for Central Europe the oscillations of the Atlantic current. Above all, the reconstruction of the latter and modeling by mathematical models is still incomplete. 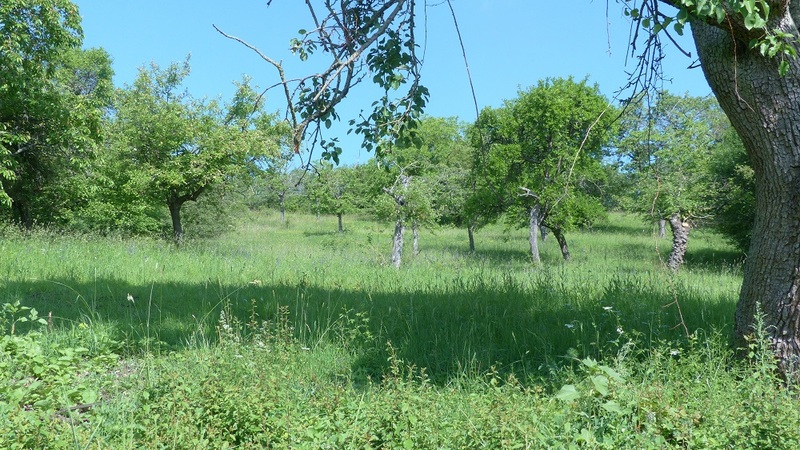 The study of the historic climate change in the area of ​​the Frankenhöhe east of Rothenburg took place in connection with the creation of a local chronicle. The access to the sources of HISKLID data for Rothenburg and even researched data of Burgbernheim, or other places have allowed a historical longitudinal section since the Middle Ages, which should not be the subject of this work. For the first half of the 19th century, weather data are available in statistical annuals for some places in the Frankenhöhe. associated harvest statistics were evaluated. A combination of the weather data with the measured data and description of the weather is possible. 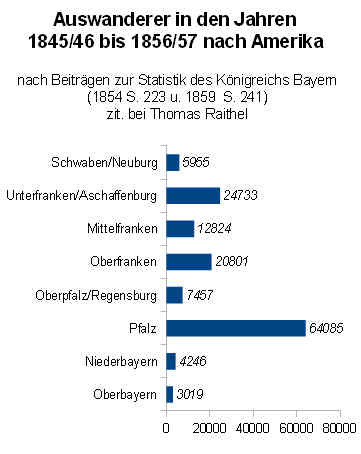 The oldest sources, known to me, of Bavarian stations are records of "über die Temperaturverhältnisse in Bayern"[Not recorded] ((monthly mean temperatures of 1773-1834 for Regensburg), those of the Weihenstephaner Jahrbuches (1869),[Not recorded], some of the series of measurements of the Benedictine Father Raphael Thaller (minimum and maximum temperatures, air pressure from the years 1783 to 1789 included.. "Meteorologische Beobachtungen im Jahr 1857"[Not recorded] from Aschaffenburg and "Meteorologische Beobachtungen im Jahr 1812"[Not recordet] from Augsburg (two daily temperature series for each day at three o'clock, as well as barometer and Hygrometerwert, as well as weather descriptions) frame the time Tambora event. 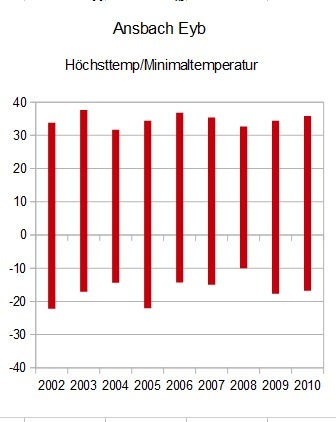 The average annual temperatures of Lamont for Regensburg show agreement with the minima and maxima and agree mainly in the maximum and minimum values. The linear regression points to a general trend towards lower annual temperatures, even if towards the end of the series a tendency towards warmer annual averages is to be expected. The evaluation according to monthly values ​​was not complete, but reveals some general tendencies. After years of warm summers and mild winters / cold winters from 1773, a phase of cooler summer months sets in after 1803, with cold winters that end only after 1833 and are replaced by hot winter months with mid-winters. 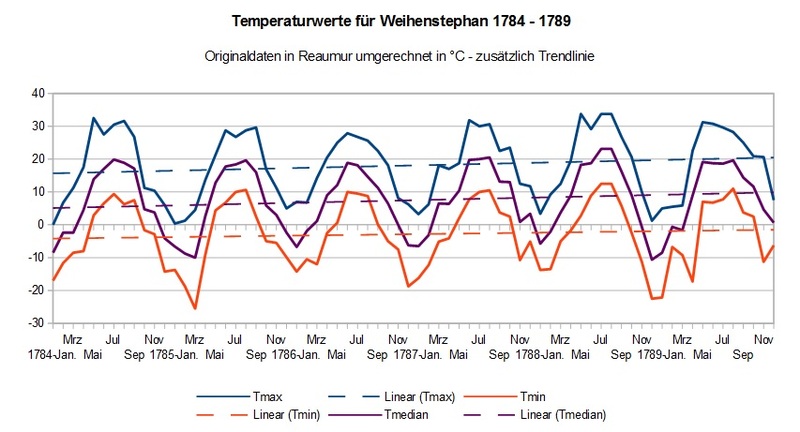 The series of measurements for the temperature maxima and minima in the months of the specified years for Weihenstephan is reproduced in the following figure, converted to ° C and indicates a tendency to warmer years for the period indicated.. The Landshut station, not far from Weihenstephan, seems to me to be important, since they have a high degree of agreement with regard to the altitude and the mean of the month. Of course, location-related differences primarily affect precipitation. Given the original data situation at the end of the 18th and the first half of the 19th century, the stations Ansbach and Landshut could be a possibility - with all due care - to extrapolate the data from Landshut for Ansbach at the end of the 18th century. The eruption of the Tambora in 1815 and the following "year without summer" may be responsible as the changed administrative division in the transition from the Principality of Ansbach to Prussia after 1792 and 1806 to Bavaria, that although rudimentary harvest data and weather data were published at the community level. In the times of the Principality of Ansbach, the harvest quantities were recorded only for the Principality. "... auf Grund höchster Entshließung des Präsidiums der Königlichen Regierung des Rezatkreises ... die sämmtlich merkwürdigsten Ereignisse ... dahier nochmals für das Gedächtnis zu führen, ..." (Jahrbuch Burgbernheim 1833/34). Thus, many of the cities and municipalities of this period are available: Ansbach, Burgbernheim, Schwabach, Wemding, which are accessible in digital libraries. 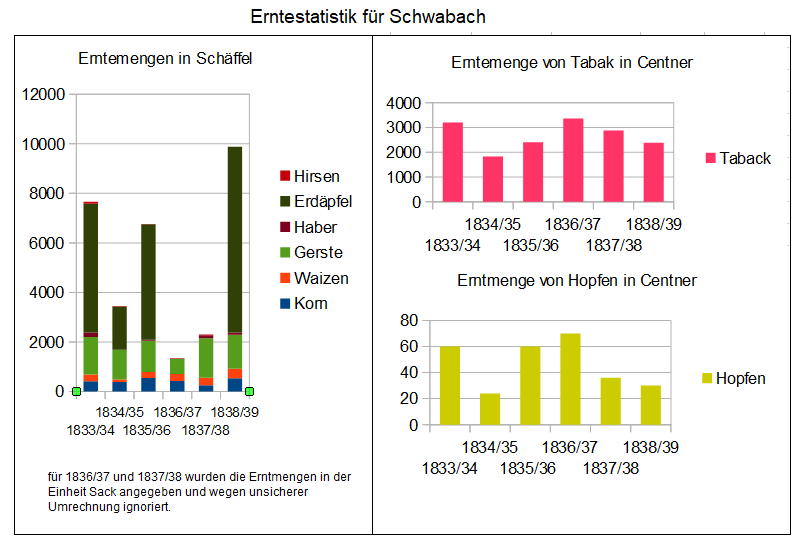 The publication of yearbooks with meteorological data with description and (although sparse) instrumental measurements and the statistical recording of harvest quantities in the years 1825-1840 for the places Burgbernheim, Ansbach and Schwabach allow the effects of climatic fluctuations in the end times so-called "Little Ice Age" in more detail At the same time, societal factors such as the abolition of lordly taxes in the Kingdom of Bavaria, which also contribute to indebtedness. Impoverishment of the rural population, and emigration to North America play a role. A problem are the different units of measure with which agricultural products were measured, the measures are partly still regional measures, Where possible, these units of measurement have been converted. In cases where this is due to different information in the literature, a representation was chosen that is independent of the unit of measure. The three places were chosen because they have a long winemaking tradition in addition to agriculture. 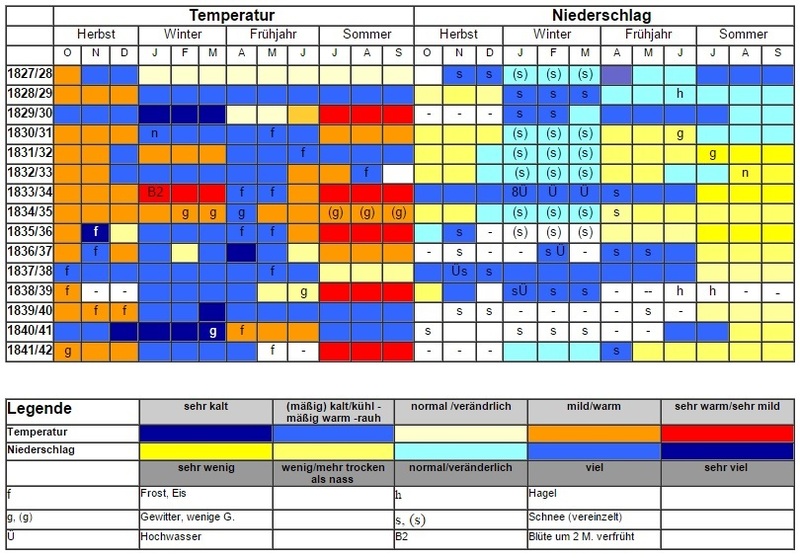 The data of the chronicle of the Burgbernheimer pastor C. Nörr from the year 1844 supplement the records stored in the database HISKLID over Rothenburg with regard to the weather events in temporal regard since the year 1016 and in view of different conditions. They are not evaluated here, but were recorded in the database TAMBORA. The expanded and more recent reports in "Neue Chronik des Markt Burgbernheim" (Ulrich Emmert, 1907) have not yet been entered into TAMBORA. 2.2.2. Viticulture in Burgbernheim, east of Rothenburg and Bullenheim. H.G. Wagner has published on "Die historische Entwicklung und Kleinformenschatz im Gebiet des Taubertales" in connection with viticulture in the Mitteilungen der. Geographischen Gesellschaft München 46, 1961, S. 99 - 149. He also talks about the former viticulture and its relics. But also east of the Tauber valley was operated in the vincinity of Rothenburg viticulture. For mapping on the Luginsland: Numerous hedge rows several hundred meters long (mainly at the borders of the parcels in the map of the Uraufnahme) from sloe, hawthorn, hedge roses. In the overlay with the relief of the railing they seem sublime. However, a random inspection of several rows of hedges across and along the slope revealed no noticeable relief differences. Since viticulture and hops cultivation were still proven in the 19th century (1834 image), heaps of rock are to be expected, but in contrast to the Tauber Valley here are the soft Estherien- and Myophorienschichten the Keupers, which contain few stones. Even before the Peasants' War and the Reformation wine has grown in Burgbernheim. These winegrowing areas decreased until 1606 for primarily non-climatic influences, but for social reasons. These newly created vineyards were located on the north and northwest slopes around the Fuchsberg southwest of Burgbernheim and west and south slopes at Hochbach north of Burgbernheim. Although the quality of the wine from Hochbach was higher than that of the north-oriented slopes, you will find at Hochbach already recorded at the time of the first recording no vineyards. Only the field name "Hochbacher Weinberg" indicates the earlier use. Obviously, despite the southern slope, the gap was too low or the need for arable land increased. The terrain at Fuchsberg is steeper. In contrast to the former vineyards east of Rothenburg, in which at the time of the first recording (1834) a few vineyards and hop acreage were present, Burgbernheim was obviously long on the large-scale fruit growing set, while in Bullenheim was operated more intensive wine growing and revision drawings (red) even after the first recording (1835) new plantings took place. Today you can find (see layer aerial view of the historic map) no viticulture in Burgbernheim. The decline of the winegrowing area, however, already sets in and this is confirmed by the above quote, before 1844. The much-cited phylloxera, which spread from the 1860s, may be responsible for the later task. The climatic influence in before 1860 is in 1.1. explained. 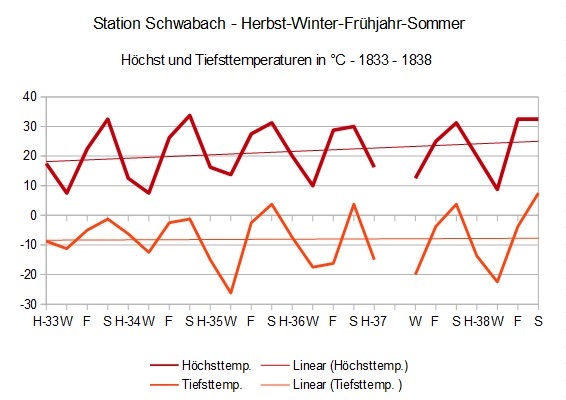 For Burgberneheim there are only a few weather data from the 19th century before and it is only descriptive data. Not only the temperatures,but also the precipitation and its distribution over the course of a year are significant, the descriptive data should be presented in a diagram. Even before the establishment of permanent weather stations,for example in Ansbach (Goede (2012, p. 262)) published since 1827 some communities in West-Central Franconia so-called yearbooks describe the meteorological conditions, also with some measurements regarding temperature and air pressure. Interesting is the detailed crop statistics that can be linked to weather events and the development of population figures. 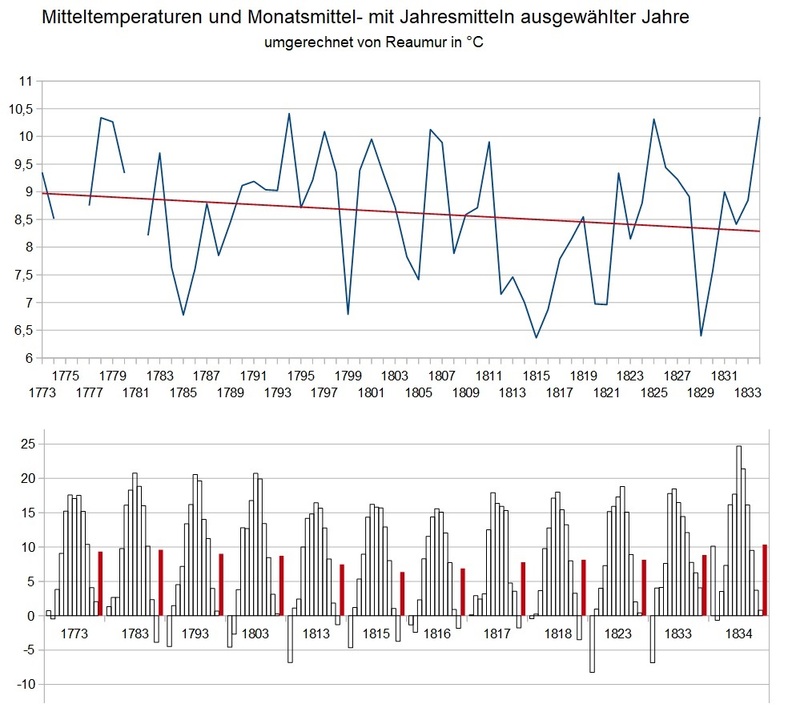 Climatologically, the period from 1827 to 1840 still falls into the so-called Little Ice Age, politically in the recent annexation of Franconia to the Kingdom of Bavaria, followed by a politically deliberate, social change with different consequences, but also on the climate at that time is due. 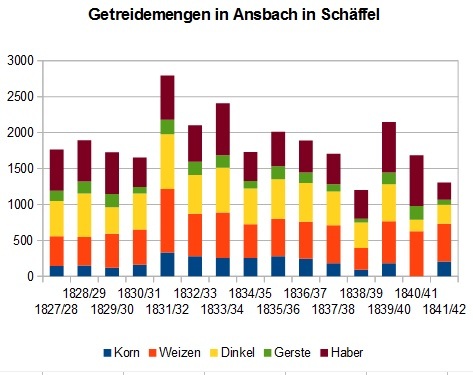 For Ansbach, weather data are available as measured values ​​and harvest quantities for a longer period of time, namely for the period from 1827 to 1841, ie over a period of around 15 years. 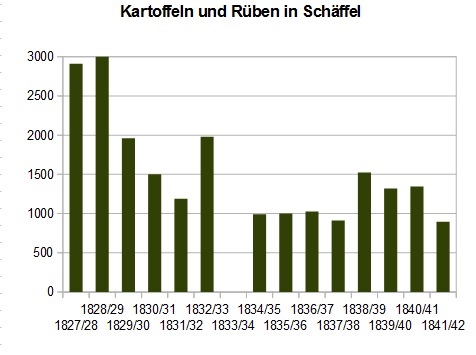 The "Yearbooks of the City of Ansbach", which appeared in the period from 1827/28 to 1841/42, at least indicate the highest and lowest air pressure and temperature for the year. The data were still in Reaumur and were converted to ° C in the figure below. The location for the recording of the measured values ​​is likely to have been located in the Hofgarten, as has been ensured since 1878/79. 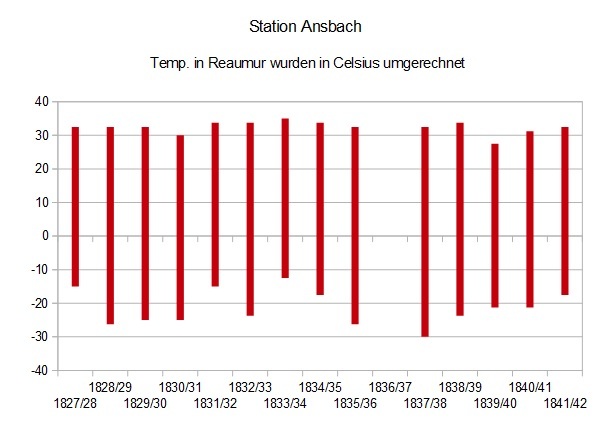 In Ansbach it was recorded and published from 1827/28 to 1841/42 at least the absolute temperature minima and maxima. Although one could interpret a certain periodicity in the diagram above, which is approximately 5/10 years. But this seems too daring. The temperature maxima and temperature minima are an important factor for the agricultural yields, but more important are suitable weather conditions for certain phases of the growth of the plants, ie temperature and precipitation as well as the type of precipitation. In addition, the sources for Ansbach describe the annual cycle of precipitation, type of precipitation and their intensity as in older sources only by season, sometimes with more accurate information of the time. 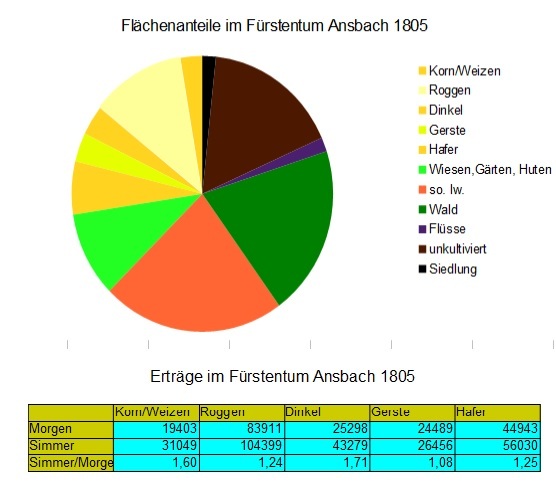 Probably the first summary crop statistics for areas Middle Franconia might be with the "Statistik für das Fürstenthum Ansbach" by Georg Friedrich Daniel Göß (1805), professor and castle librarian in Ansbach. Part of his statistics are shown in the figure below. 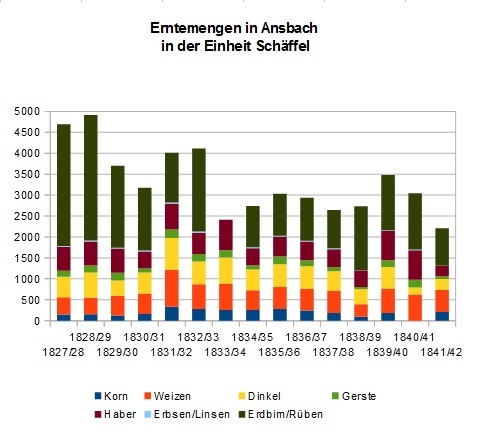 The statistics of the Ansbach Yearbooks are another important source for the regional crops. Preliminary remarks on the conversion of the original data into diagrams. Harvest quantities are given for cereals in the sources in both "Schober" and "Schäffel". The unit "Schober" refers to the unroasted grain (1 Schober = 60 bunch / sheaf of straw). This unit can not be defined absolutely, but was important in the 19th century as a building material in connection with clay. 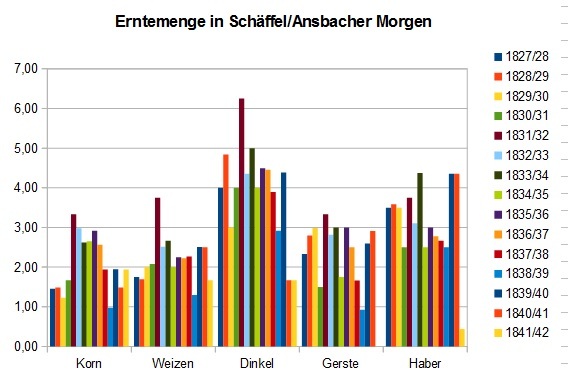 Since "Schäffel" is a measure of space, which was subject to strong regional differences in the 19th century and no meaningful conversion is found in the literature available, the unit of Ansbacher Schäffel is used. In addition, a direct conversion into weight units is possible only with knowledge of the different specific gravity of the individual crops. Hops, clover and hay teas are indicated in Centner. Compared to the two years at the end of the 20s of the 19th century, total revenues until 1841-42, with fluctuations, fell to just under half. Turnip and potato crop decreases are particularly strong, providing a substantial basis of nutrition for the rural population and feed for the pigs. In 1833/34, the harvest of potatoes and turnips almost completely failed. The harvested Schober (cereal with stalk) used for threshing litter after threshing the litter are also subject to strong fluctuations, although not as strong as those required for the nutrition of the population to flour processed grain. By the mid-30s to the beginning of the 40s of the 19th century, total yields were only half as high, sometimes only a third of the yields at the end of the 20s. The hay and the ohmet (second cut) as cattle food is subject to large, maximum 50% fluctuations to the maximum value. The highest yields per unit area were always produced by Dinkel, which is hardly represented today, and is again represented more frequently in organic farming. Nevertheless, all cereals lose half to one-third of the maximum value in terms of grain yield during the period under consideration. 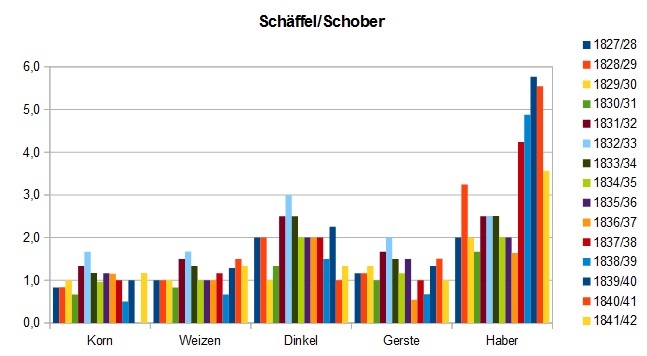 The comparison Schäffel per Schober characterizes the quality of grain formation for each type of grain. In particular, the oats seem to love the weather of the years 1840/41 and 41/42 with regard to grain formation. Another important source is the book "Anbau und Ertrag, Besitverhältnisse und Stückelung des Bodens, dann Lohn der Landbau-Arbeiter im Königreich Bayern" from 1857. Some results. Even if the thermometer described above had been in Schwabach, the data cannot be translated into current temperature scales, is it probly has been a so-colled Florentine thermometer, which actually meaxures air pressure values. W. Lenke (1964) describes used Florentine thermometers and the problem of the conversion in today's common temperature scales based on the measured values ​​from the year 1709. For selected thermometers and stations he calculates with caution the daily early values ​​in January to March of the year 1709 but in ° C calculated as the lowest temperature he for Berlin -29.4 ° C (10 January 1709). 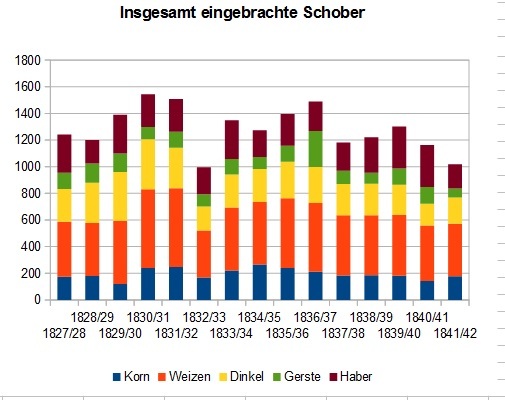 The yearbooks of the city of Schwabach published only for the years 1833/34 to 1838/39 record at least the temperature and barometer maxima and minima for the four seasons with indication of the date. 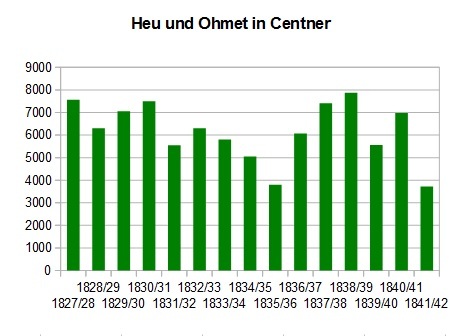 The areas were stated in the first reporting years until 1835/36 still in "Morgen". The conversion to the Bavarian area unit "Tagwerk" = "Bavarian morning" took place in the reporting year 1836/37. In order to be able to compare the harvest quantities of Schwabach with those of Ansbach, these and the old units in Schwabach were interpolated with the "Morgen Alt Ansbacher Maß" . in which partly autumn, spring and summer were very dry, especially in the years 1831/32, 1833/34 and 1835/36. The following years were only the summers dry. With the exception of the years 1833-34, when the flowering of trees in Ansbach began in January, and the year 1834/35, the winters were cold and the summers generally warm to hot. The dry years in the first half of the 30s and partly the unfavorable weather during the year led to considerable crop reductions. The same tendencies show the harvest quantities for Burgbernheim, blatantly with the wine and for Schwabach in the reproduced years, also with today's special cultures tobacco and hops. 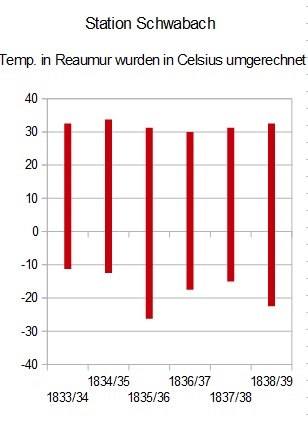 GOEDE ( 2012) publishes the individual temperature values ​​on a daily basis for the period from 2001 to 2010. For reasons of comparability, only the highest and lowest values ​​are shown in the figure. It has to be considered that, in contrast to the 19th century, the highest and lowest values ​​refer to the calendar year. Although the locations of the temperature measurements are not exactly the same, it can be concluded by careful comparison that the lowest temperatures in the first half of the 19th century were up to 8 ° C lower than in the first decade of the 21st century, the highest Summer temperatures are 2-3 degrees above the temperatures of the years 1827-1842. 1. The period considered falls into a period of generally reduced sunspot activity with intermediate maximums. 2. After the Tambora event of 1815 and its effects in 1816/17, it was possible to observe very closely the phenomena of high altitude smoke caused by volcanoes and short-term climatic changes. In his essay, Raithel reiterates a representation after Adams (1993), according to which German immigration has taken place in several waves since the 19th century, the causes of which lie in the processes in the source countries as well as in the destination country. From 1776 to 1783, soldiers from Middle Franconia took part at the Revolutionary War in America. Of the approximately 2,400 soldiers fighting in America, around 1,200 returned, 700 remainded in North America and around 500 fell or died as a result of epidemics. The returnees reported in their homeland on the agricultural, climatic and social conditions, which differed so much from those of their homeland (Erhard Staedtler, 1956). The successive abolition of the feudal manorial structures after the annexation of Franconia to the Kingdom of Bavaria, which was completed to the mid-19th century overthrew many farmers, but also mill owners (examples in "mills and their history in the region on the Romantic Road", not yet published) in an economic crisis, which is evidenced by foreclosures of house and yard in the "Intelligence Journal for Middle Franconia" and the "Intelligenzblatt for the Rezatkreis". An emigration to North America began in the mid-1830s, whereby occupation and name are known (cf.) An important factor for emigration is also the agricultural income which declines from the mid-30s on account of the climatic situation. Schober Schober was a German piece measure for straw in Nuremberg. For the term bundle or sheaf, the term bulk was often used (calculations, statistics). The Schütten- or straw was a bundle bound threshing (not broken, Upper Bavarian the Schütt) long straw. Simmer The (that) Simri, Simra or the Simmer (from high-German sumbir meaning basket) was a measure for measuring grain. A Simri often had 22 liters. Today, the digitization projects of various libraries open up time-and-place-independent access to every historical document, requiring a lot of time and effort 15 years ago to access it. Despite the networking via the "Deutsche Digitale Bibliothek" and the "Europeana", the search in special digital libraries proves to be necessary, the search structures are not uniform and also the search algorithms are not sufficiently effectively structured in the scope of the data. This refers to the logical links of the search algorithms with regard to keywords. Specifically for the search for climate-specific data and quotations, the database TAMBORA proves to be indispensable. Parts of the sources used here that were not yet available in TAMBORA were entered in the database.